You may have heard the saying, "you can't manage what you don't measure". While there might be an element of truth in the saying, not everything in life, or business, can be measured accurately. Because of the abstract and somewhat uncertain nature of innovation, finding the right metrics to measure innovation can be tricky. 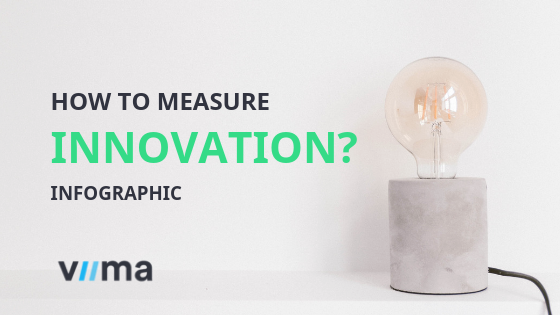 While we acknowledge that finding the right metrics to measure innovation can be difficult, it doesn’t have to be overwhelming, as there are a number of metrics that are commonly used to measure innovation. In this post, we'll look into different types of innovation KPIs, when to use them, and how to get the most out of them, hopefully making the decision process a little bit easier. 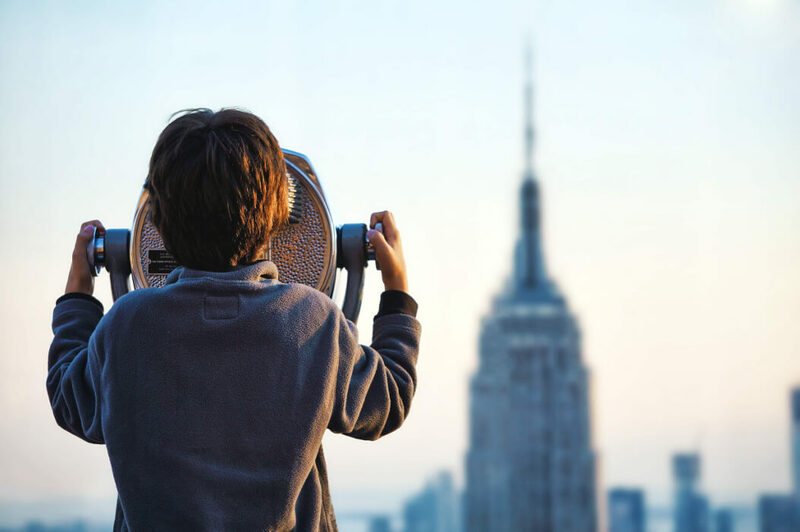 This article is a part of our extensive Innovation Management blog-series, in which we're looking to explain the big picture and address all of the most important themes regarding innovation management. What to keep in mind when measuring innovation? Why measuring innovation is worth it? 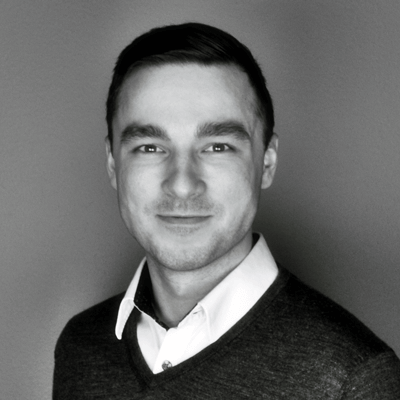 How to get the most out of your KPIs? Choosing the correct KPIs for measuring innovation is necessary because you usually tend to get what you measure. Your goals and KPIs direct your efforts and actions towards them and help people to adapt their behavior as well as take action to reach those goals. The other side of the coin is that untracked activities are easily forgotten, which can lead to a couple of different problems: there are organizations that try to measure too many things at once, as well as those who aren’t measuring anything at all. In fact, 16% of those aren’t measuring any of their innovation management efforts or results because of the uncertainty of what should be measured in the first place. Needless to say, these organizations aren’t able to manage their innovation very precisely. The tricky question here is: How do I make sure that what I do and measure will actually lead to innovation? Before delving deeper into this quite an extensive topic, we should first clarify what to keep in mind when choosing your innovation KPIs. Measuring innovation is only worth it with a set of metrics that help you to move your business forward. This might not always be straightforward to figure out, so many organizations tend to measure what’s easy – not what’s important – instead. It’s easy to pick out a couple of simple KPIs without thinking whether they will actually be useful for your business in the long run. 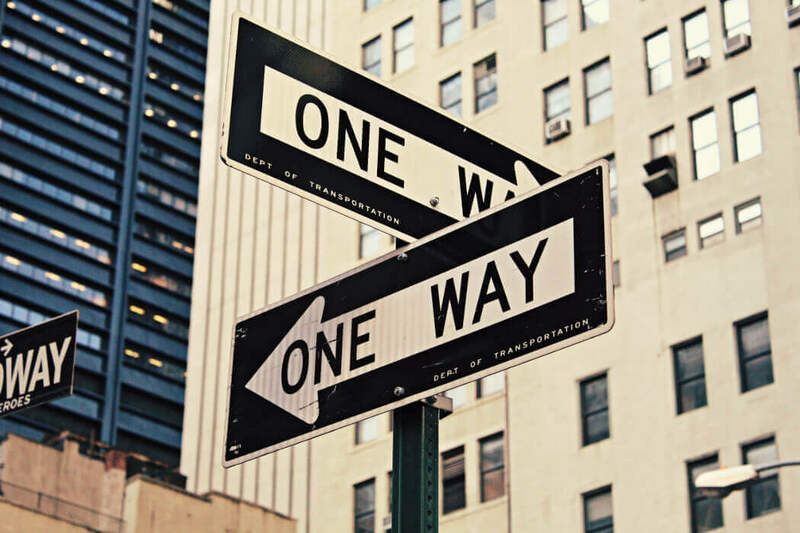 The most important function of measuring innovation is simple: to ensure you’re going to the right direction. Innovation metrics allow you to see if you’re doing enough of activities, and more specifically, enough of the right kinds of activities to be able to actually achieve your results. Innovation metrics allow you to see if you’re doing enough of activities, and more specifically, enough of the right kinds of activities. We believe that as long as you’re persistently doing both and measuring innovation in a systematic manner, you’re likely to see results. Although measuring innovation is definitely worth it in most cases, it should be kept in mind that not all metrics work for everybody. As a matter of fact, there are certain types of metrics that everyone should pay attention to. While some metrics are more straightforward than others, some of them can be quite ambiguous. The latter types of metrics, along with the too simplistic metrics we already talked about, should be approached with caution, as they often lead to undesirable results down the road. As mentioned, KPIs have a huge impact on behaviour, which is why it's important to try to analyze how your KPIs drive your employees' behavior. Although some metrics may seem great at first, the results down the road might not be what you wanted to achieve. Therefore, you shouldn't be afraid to change your metrics as you learn how the organization responds to them. If we choose to measure personal development, it would for example be somewhat dangerous to measure the time spent on activities that support personal development, as it’s quite likely that people will not spend their time as effectively as possible if everyone is given the freedom to choose what to work on. Instead, it would be smarter to measure the level of abilities or the progress made compared to the starting point. Another example of a “dangerous” metric is the number of new products launched. You may first think that the more new products you’re able to launch, the better, but this is not the case. 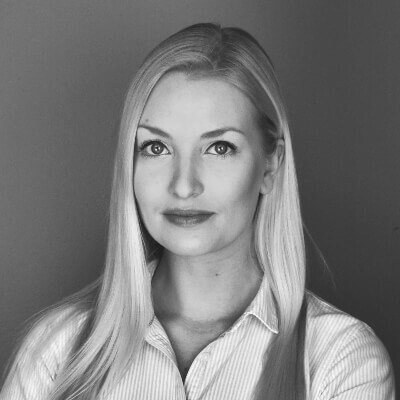 If you currently have 100 products in your product portfolio, not launching any new products is a clear indication that you’re not making much progress and likely aren't very innovative. However, launching just 3 great new products is likely to be a much better result than launching 10 mediocre products. It's usually not a great idea to sacrifice quality for quantity. Simply put, choosing the "right metrics" and avoiding the “wrong ones” is all about defining what you want to achieve and systematically measuring your activities to make sure they support your goals. Another thing to keep in mind when measuring innovation is Clayton Christensen’s concept Innovator's Dilemma that was introduced in 1997 with his book that bears the same name. 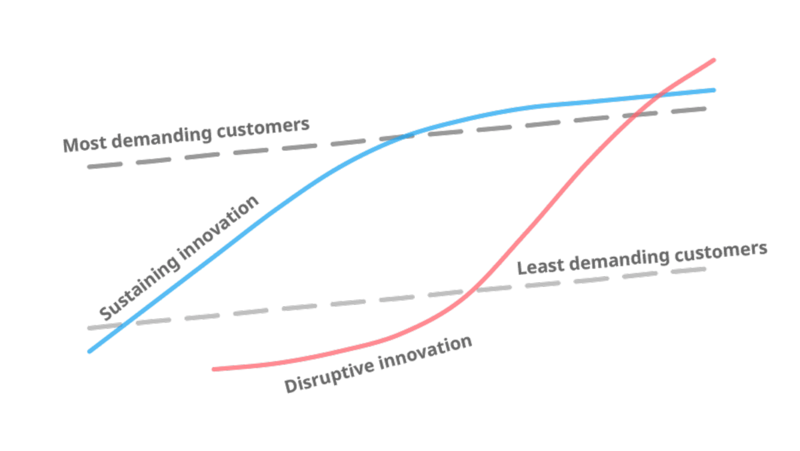 In his concept, the core of the dilemma is that in the early stages of innovation, and specifically the disruptive kind, new innovation is usually inferior to existing products and services on the market because it's measured with the same metrics and value drivers as the existing products. Because of this, these new products and services are initially valuable only to a small subgroup of the market with different value drivers, and therefore aren’t much of an interest to the mainstream customers, which are typically making a more profitable customer base. 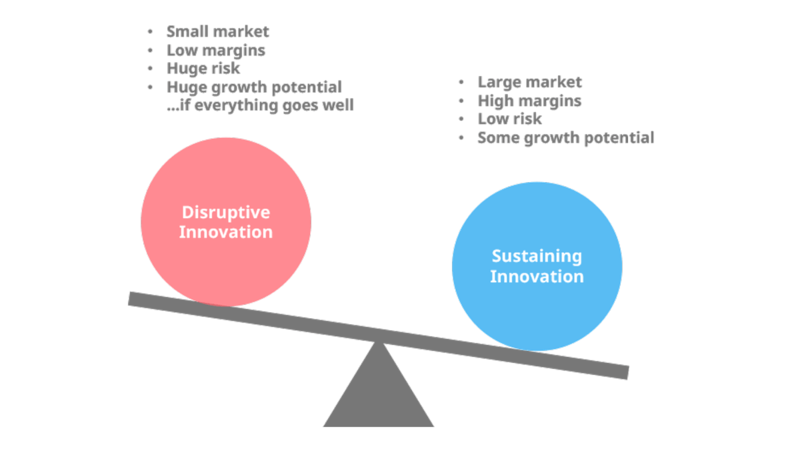 As disruptive innovation initially caters to only a small subgroup of the market, established companies aren’t necessarily willing to invest in these disruptive initiatives in the early stages. It’s debatable, whether traditional metrics of "success", such as profitability, should even be measured at the early stages of the innovation process, because disruptive innovations aren’t necessarily of interest for the high-end mainstream customers. This is where the organization typically has higher profit markets, which is why this is an important concept to remember when choosing your innovation KPIs. Without further ado, let's have a closer look at the terminology related to these innovation KPIs. As already mentioned, the main role of innovation metrics is to make sure you’re doing enough of the right activities to reach your goals. They are typically divided into two different categories: input metrics and output metrics. In other words, “what goes in to your innovation process and what comes out of it”. Input metrics measure if you’re doing enough of the right activities to reach your goals and whether you allocate your resources properly, whereas output metrics measure whether these activities and resources have had the desired impact on your innovation process. Input metrics measure if you’re doing enough activities of the right types to reach your goals, whereas output metrics measure whether these activities have had the desired impact. When deciding on your innovation metrics, we recommend to measure both inputs and outputs as measuring only either one of them is bound to yield one-sided results. Keep also in mind that if you want to change your output, you must most likely change the input first. As the name indicates, input metrics, are used for measuring your investments or “The I in ROI”. In practice, an investment can be for example money, time or talent devoted to a specific activity related to innovation management. Measuring inputs is a great way to gain insight into how your resource allocation or innovation portfolio matches your strategy and can be considered to also cover metrics regarding the process itself: e.g. how many ideas are passing through to a certain phase. 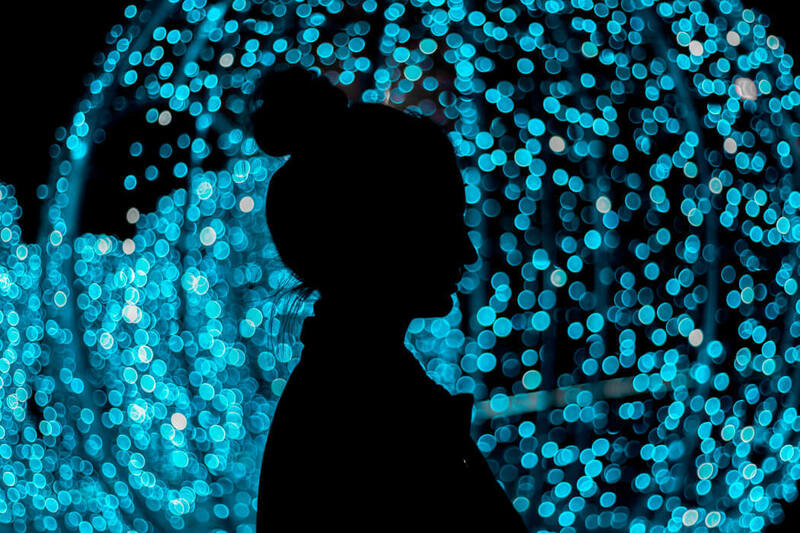 We think that in general, input metrics are a great starting point for measuring innovation in the early stage because input metrics are responsive. When measuring inputs, you’re able to react to changes sooner. In general, input metrics are a great starting point for measuring innovation because they are responsive. When measuring inputs, you're able to react to changes sooner. It is, however, important to keep in mind that input doesn’t guarantee output. Even if you had all the possible resources in the world, you may still never see the results you want if you’re not doing enough of the right things or aren’t doing them well enough. One example of this is an idea challenge, where your goal is to get as many actionable ideas as possible in a certain, limited period of time. In this case, many would probably focus on measuring the number of new ideas generated to drive engagement. The problem here is that it isn’t telling much about how good the ideas you get actually are, or if any of the ideas were, for example already put into practice during the challenge. In this case, instead of just measuring the total amount of new ideas created by the participants, it would be more relevant to measure the number of ideas that will be implemented after or during the challenge, which technically speaking would be more of an output metric. The other end of the spectrum is output metrics, which is a term that is used to refer to your returns, or “The R in ROI”. In other words, output metrics measure the results your innovation investments have yielded. As such, they indicate if your investments are actually turning into something useful. Output metrics measure the results your innovation investments have yielded and indicate if your investments are actually turning into something useful. In general, organizations are more likely to rely on outputs than inputs. Although outputs are satisfying to measure, they are typically less actionable as they often don't tell you what wen't well or what went wrong. In addition, changes in output metrics show only a certain time after the activities have taken place, which especially in the case of disruptive innovation, can be quite a long time. Therefore, it might not be smart to focus on measuring ROI too early. Instead, in the beginning it would be smarter to assess the time horizon, i.e. how long it will take to breakeven. In later stages, it makes more sense to pay closer attention to outputs. The first four of the five categories represent each of the different aspects of innovation management, whereas the remaining one focuses on business and product related metrics. In this chapter, we'll briefly introduce each category and provide you with some simple examples of innovation metrics in each of these categories. Keep in mind that while it's valuable to acknowledge how each of the five aspects affect your innovation management process, it's not necessary to have concrete metrics to measure all of the following aspects. Capabilities refer to the different abilities the organization has for creating and managing innovation and revolves primarily around people. Capabilities refer to the abilities, practical skills, unique insights and know-how of the people. In addition, it also covers the tacit knowledge, and other information capital, as well as financial capital needed to create innovation. Capabilities refer to the different abilities the organization has for creating and managing innovation. If you can answer to the question: “What is our set of capabilities required to innovate?”, you’re most likely to be able to choose the right metrics to measure this. You could start by measuring the number of new challenges provided for employees or the level of competence and abilities in a team. By structures, we refer to the organizational structure, processes, resources (the right tools to support innovation management, such as an innovation management software) and infrastructure of the organization that enable the effective use of the aforementioned capabilities. Your structure metrics should support resource allocation, efficient innovation management and idea-to-launch process, as well as speed of testing of new ideas. You can encourage these structure-supporting aspects by for instance measuring the relative or absolute budget allocated to innovation or R&D, the velocity of the build-measure-learn feedback loop or the cycle time of ideas in each phase of the process. Culture enables the organization to acquire the capabilities related to people. 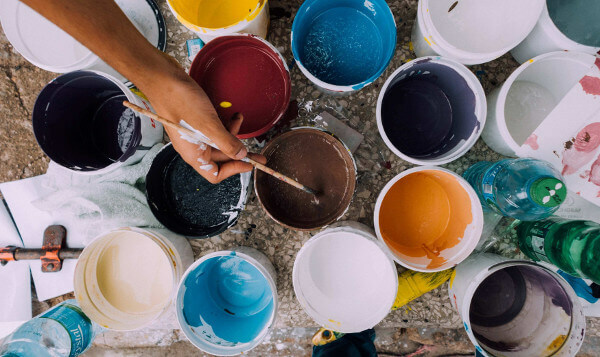 Although it might be relatively difficult to effectively measure direct impacts on culture, the right type of culture may have a tremendous effect on the innovativeness of an organization. An innovative company culture supports the process and need for always getting better, learning and experimenting at a fast speed, as well as balancing between freedom and responsibility. Therefore, your innovation metrics should always support these traits, directing your initiatives towards more innovative company culture. Some of the key supporting input metrics in this category could be the number of new ideas and initiatives coming straight from employees vs. coming from management, or the time spent on development vs. operations by all levels of organization. The output metrics supporting an innovative company culture could be the employee participation in innovation activities as well as the employee score for innovativeness of the organization. For some larger firms, it may even be relevant to measure the number of employees trained in innovation methodologies over a certain period of time to keep track of the overall improvement in the company. Strategy is ultimately about making a deliberate choice between a number of feasible options to have the best chance of “winning”. It is the high-level plan for the organization to achieve its goals and long-term success, whereas leadership is needed on the way there. The link between strategy and innovation is an extensive topic, because each organization has a unique perception of what strategy means to them. This shouldn’t obviously be separate from the execution and your metrics should be aligned with your strategy and also with each other. It is, however, often easier said than done, because most of the organizations fail to link their strategy to concrete operations. In fact, only 30% of the strategies succeed. Most of the organizations fail to link their strategy to concrete operations, which is why only 30% of the strategies succeed. If you want to learn how to measure your strategic aspects, we recommend you have a look at The Play-to-Win Strategy Canvas, which can help you to test your assumptions and find metrics to measure whether these assumptions support your strategy. The point is to link you strategic choices to concrete actions by assessing what needs to be true for the choices to be good ones in order for you to test them. 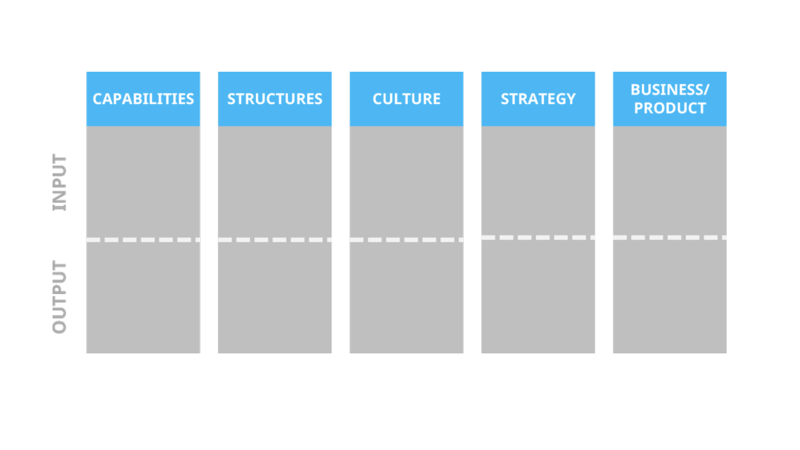 The Play-to-Win Strategy Canvas works well when you want to make sure your concrete actions are actually taking your strategy forward. Some concrete leadership & strategy metrics are the percentage of management’s time spent on strategic innovation or the number of executives receiving training related to innovation (for example innovation management process related, or industry specific training). The aforementioned metrics can be good if you want to renew your business or your staff doesn’t have much prior experience in innovation management. It is, however, not relevant to measure these types of things if you’re used to innovate constantly (for example businesses that are operating in creative industries). Needless to say, in order for you to achieve your strategic goals, your metrics need to reflect them as well, because the last thing you want to do is to accidentally focus on incentivizing people to do things that are counter-productive. As already mentioned earlier, this category is slightly different compared to the others because it’s more focused on measuring your results, whereas the four first ones measure the conditions for you to succeed. Business and product metrics, or so called “ROI metrics” are probably one of the most straightforward metrics of the five categories, as they focus on measuring your results, such as the number of new products launched, patents acquired, the revenue gained from new products launched, or new markets entered the past year. If you’re in the early stage of your innovation lifecycle, it might be smart to measure the product-market fit for new initiatives or the growth rate for new products as well as the actual vs. expected breakeven time. When it comes to innovation, it's vital to understand what, when and how to measure your innovation KPIs to get the best possible results, but as we already pointed out, each situation is different, and it’s impossible to introduce a general framework that will work for everybody. There are, however, a few tips that might help getting the most out of your innovation KPIs. The problem with measuring a large amount of metrics is that people aren’t capable of thinking about numerous things at once. Human brain gets distracted easily, and if you’re forced to think about tons of different metrics, you're likely to get confused, which again shifts focus away from what really creates value. It’s better to start with too few than too many metrics, and set your goals using just these metrics, because as in innovation management in general, keeping it simple goes a long way. In an ideal world, your mix on innovation metrics would include both input and output metrics as well as qualitative and quantitative metrics in each of the five key categories. In practice, however, it may not be realistic to measure your activities with multiple different metrics in all of the categories, because if we’d measure each of the five aforementioned categories with for example 4 metrics (input, output, qualitative and quantitative), we’d end up with at least 20 different kinds of metrics. 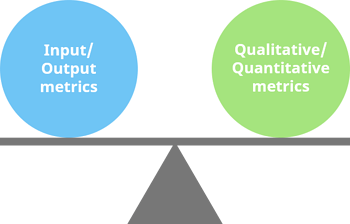 Although you need to prioritize some metrics over others, try to find the right balance between input and output metrics, as well as qualitative and quantitative metrics. What metrics to use and when is a matter of maturity and uncertainty of your business. 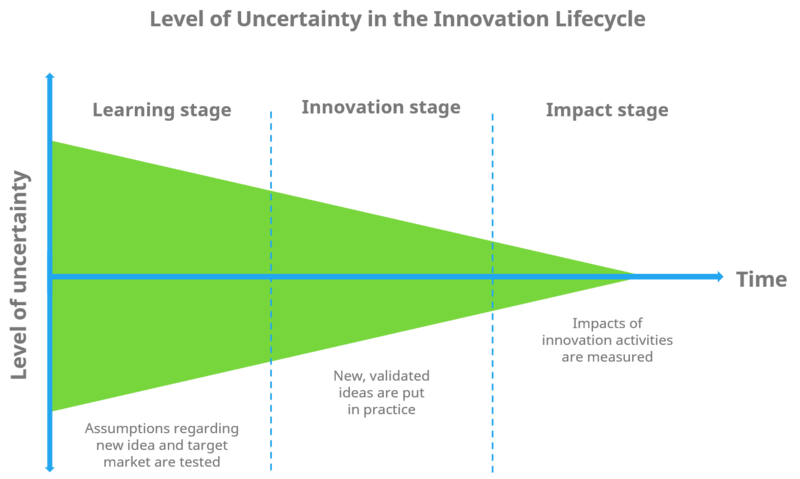 As opposed to the big picture, the following model will look at the level of uncertainty from the perspective of an individual innovation project in different stages of its lifecycle. From the innovation portfolio point of view, all innovations could be measured systematically for example based on each stage of the idea lifecycle. In the beginning, your assumptions regarding your idea and target market are tested. When the level of uncertainty is high, you may want to focus on input metrics, because results take time, and the correlation between activities and results may be difficult to see, which may lead to worse decisions and demotivation of people. In this stage action is taken and new ideas are generated, tested, and put in practice. As your new ideas are validated, the level of uncertainty slowly decreases, and you're able to get a better overview of where you're headed. In this stage, the impacts of your innovation activities are measured, for example with business and product metrics. Again, as the level of uncertainty decreases over time, and you're able to see results, it makes more sense to measure the ROI of your innovation activities. 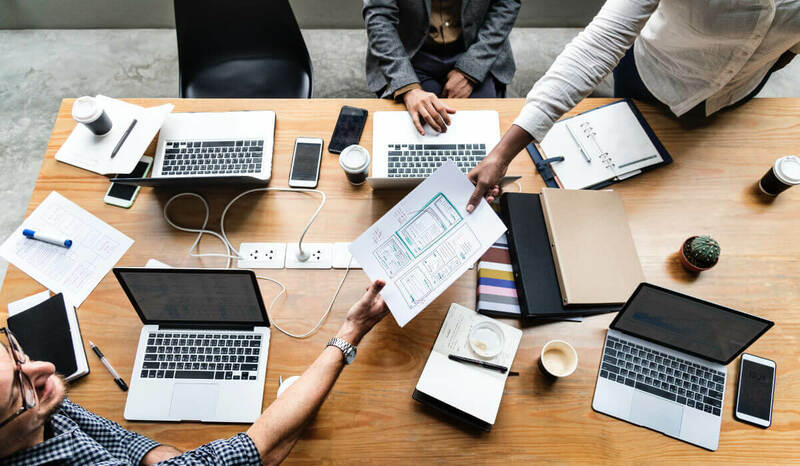 Even though your overall goals and metrics should be aligned, Your R&D team is most likely to benefit from different types of goals than your sales team, which is why each team and department need to have their own individual metrics. To get the most out of your metrics, make sure all the metrics are clear for everybody, and if not, organize training to make sure everyone understands what is (and what isn’t) measured and why. Measuring success is apparent for the majority of organizations, but it's easy to forget that the greatest improvements are usually made in situations where things don't go quite as planned – at least when you're willing to learn from them. Don't make the mistake of closing your eyes in those not-so-successful situations, but try finding ways to learn and improve the way you operate to avoid repeating same errors in the future. While it can be rather difficult to choose what to measure, measuring innovation doesn't have to be a rocket science. If you want to move your business forward, you should focus on trying to get better every day and use all the possibilities to improve and learn to make sure you’re constantly moving to the right direction. Your strategy and the level of maturity of your business set a direction to choosing your innovation KPIs, and if you keep a balance between input and output metrics, you'll eventually see if you’re doing enough of the right things to be able to achieve your goals. Keep in mind that measuring innovation is a continuous learning process, and you most definitely need to reassess and change your metrics as your business and innovation management processes evolve. In the meanwhile, start simple and focus on finding a few metrics that actually benefit your business now and in the long run. If you found this guide useful, you can click on the link below to get the infographic version of this post. In addition, it includes some more interesting information about innovation management metrics.